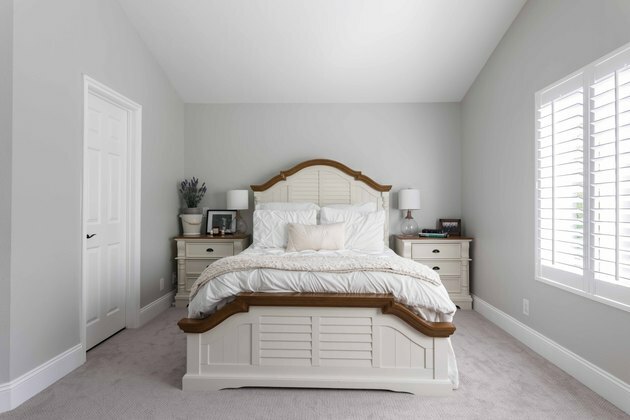 When the location can't be beat — two minutes from your extended family, at the end of a sweet suburban cul-de-sac, in an award-winning school district — you might find yourself looking past things like royal blue interior paint, a mirrored pony wall, and a kitchen ceiling painted gold. 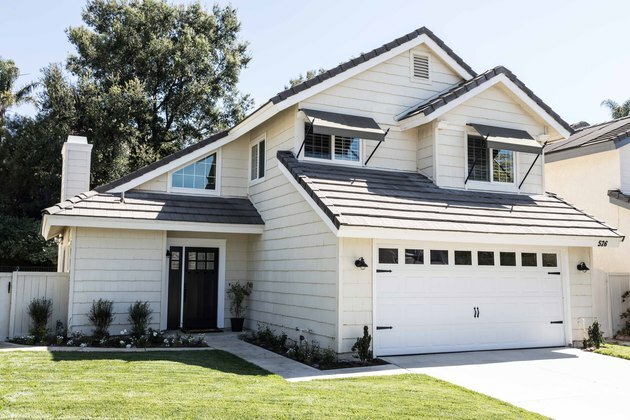 That's what Kaely Ketchum, an executive assistant, did when she first walked into the two-story, single family home in Oak Park's Country Glen neighborhood, an unincorporated area near Southern California's Simi Valley. "It was definitely out of date and not our taste at all," she says. Her husband, Gavin, who is in commercial real estate, almost walked out halfway through the tour. "I saw the potential though." With a tight eight-week timeline once they closed on the house, in December 2017, the Ketchums launched a top-to-bottom interior renovation. 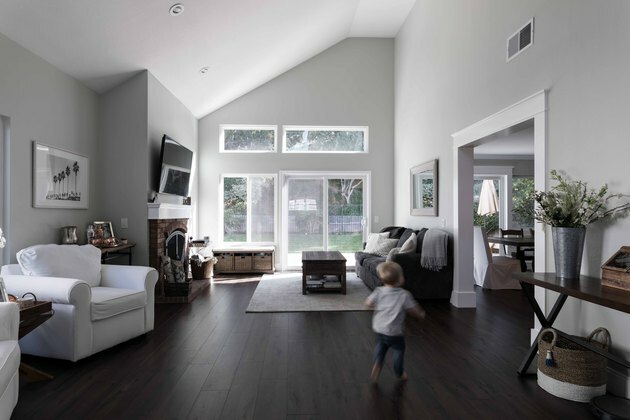 They opened up the two main living spaces, bringing down the wall that separated the great room from the kitchen, added dark wood floors throughout the first floor, and a durable light gray carpet upstairs. But perhaps the most important touch was to repaint the entire house in Benjamin Moore's Moonshine, contrasted with a bright white trim. "We wanted something fresh, clean and inviting," explains Kaely. 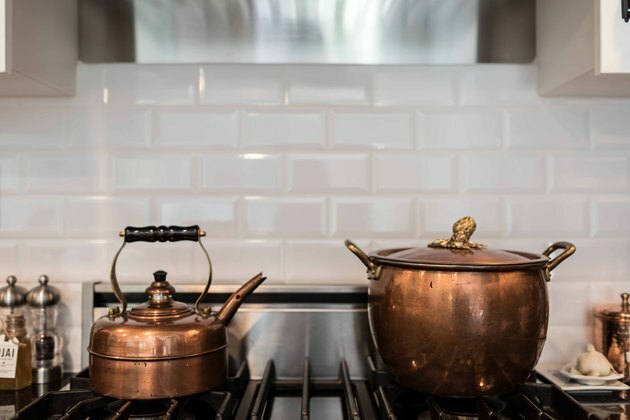 The result is a soothing, cohesive cool palette with the traditional details Kaely prefers, like copper pots and crisp white millwork. Indeed, the millwork is where they splurged. 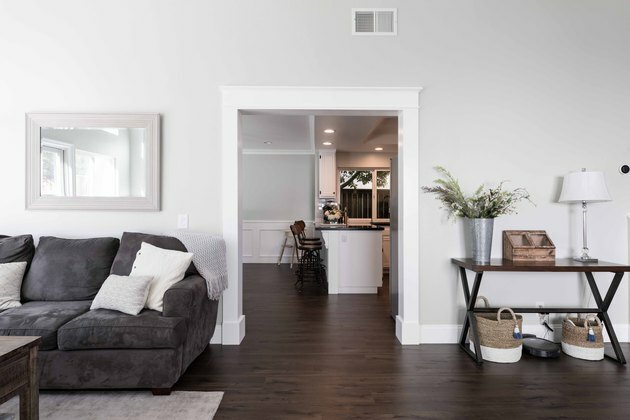 "We really wanted some nice wainscoting in the dining area to give a more sophisticated look, and wanted to add high baseboards and pretty trim around the doorways," says Kaely. 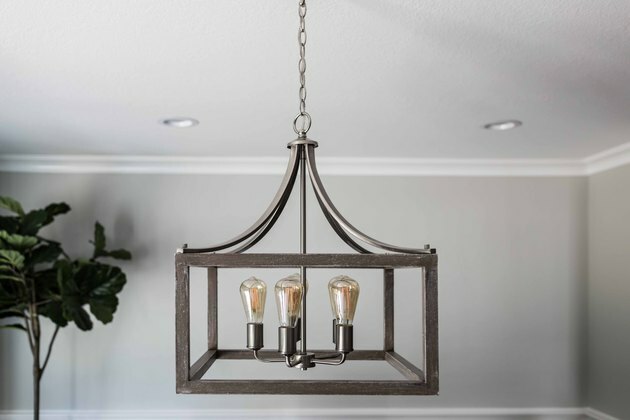 Much of their existing furniture fit perfectly into the space, as it already had the mix of modern farmhouse and traditional aesthetic that the couple gravitates toward. 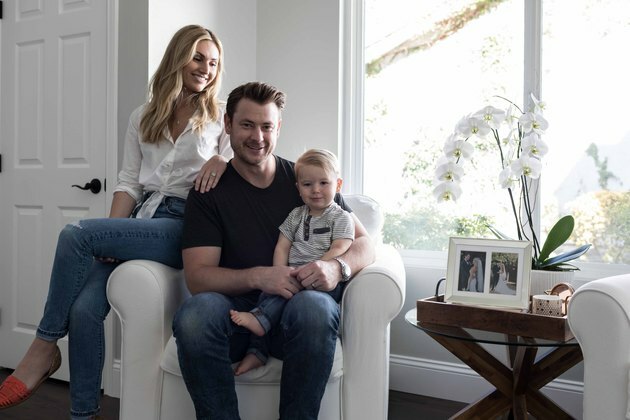 "Having a one-year-old [her son, Mack], I actually found it easiest to do most of the shopping for pieces online," Kaely claims, who leans towards Ballard Designs, Joss & Main, and Wayfair. 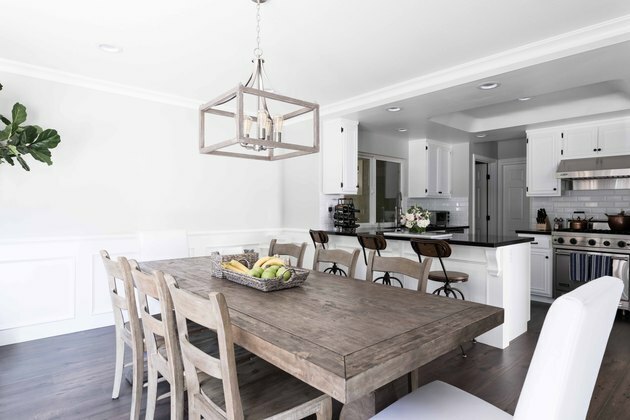 The best part, though, is just how open the space is — allowing for entertaining, whether that's dinner on their farmhouse table or a ball-pit playdate in the great room. "We love being and playing together as a young family," says Kaely. 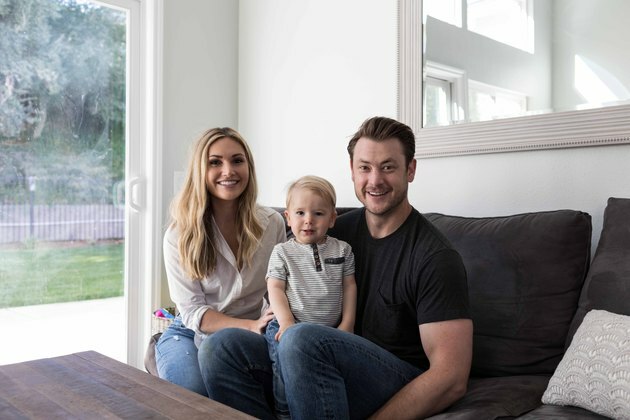 "I think this new home truly allows us to do that in the best way possible." One of the first things the Ketchums did was to open up the wall between the kitchen and great room. 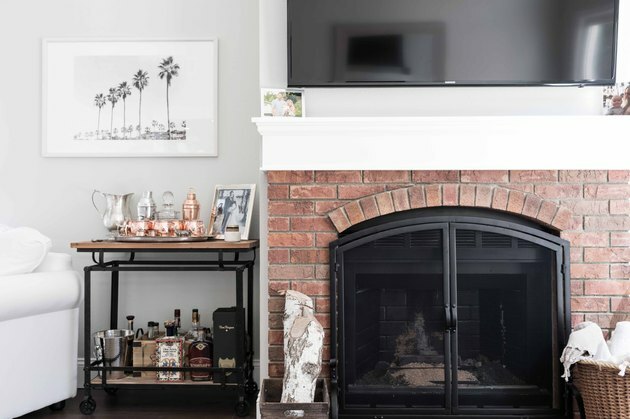 The great room is meant for entertaining, with it classic bar cart and flat screen. 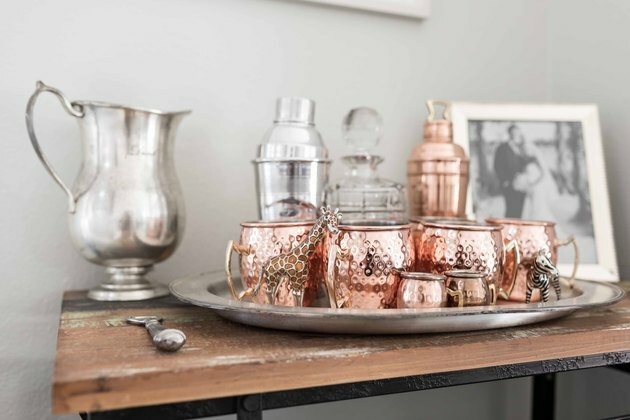 Gleaming copper is a recurring theme throughout the living space. The farm table is one of Kaely's favorite pieces. "It's huge, sturdy, and just our style," she says. "We love how we don't need to be super careful around any of our furniture, too. We have a little baby who climbs on and puts his hands on just about everything so we need durable pieces that also look pretty." 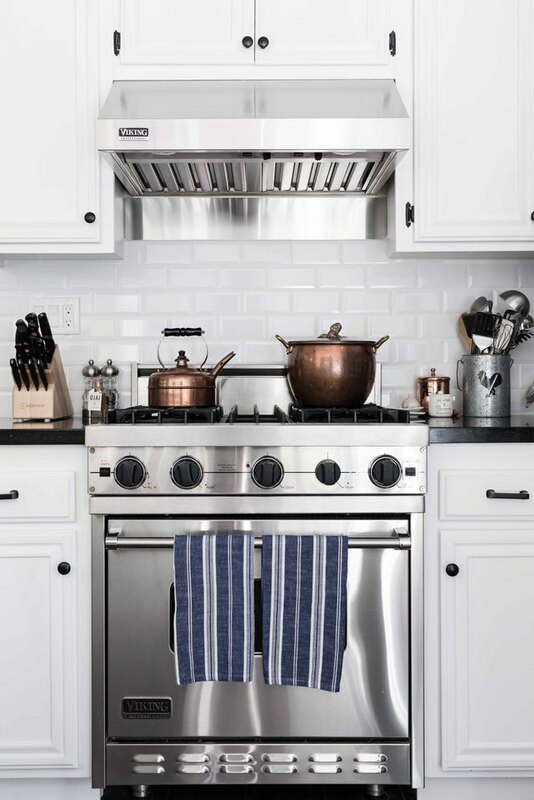 The well-appointed kitchen is done in a traditional style. Here, too, copper is a key accessory. The couple splurged on the millwork, which gives the suburban home its traditional flair. The Ketchums remodeled the downstairs guest bath, while the two upstairs bathrooms are waiting for the next wave of renovations. Upstairs, the master features the durable light gray carpet Kaely chose for the entire second floor. 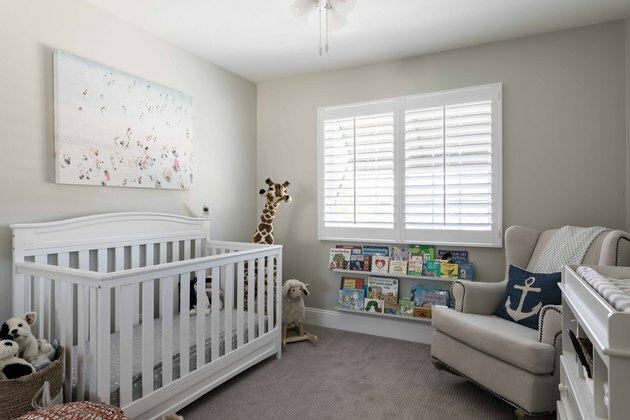 Their son, Mack's, nursery has the same muted, cool tones, with age-appropriate pops of color. 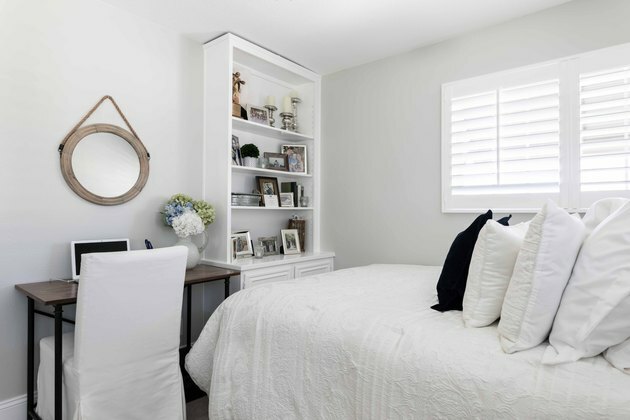 A third bedroom is also tastefully decorated in a clean, traditional style. Family is at the heart of the Ketchums decision-making process. "The fact that we were so close to Gavin's parents was the initial draw," says Kaely. "Plus the neighborhood is absolutely perfect for a young family."